A clown project for a young child needs to be simple and fun with a learning undertone. Early childhood clown crafts can help teach shapes, basic chemistry and hand-eye coordination. There are many clown projects that are suitable for early childhood; the teacher is responsible to make sure the activities are adjusted to be appropriate for each age level. The limitations to the following activities only depend on the available materials and time restrictions of the classroom. Use these ideas to decorate for a clown party or for a simple week of clown activities. Review clowns when the circus is in town and ask parents to provide pictures of a real circus clown. Preparation: Create a model clown with a triangle hat, a circle face and a square body or shirt. Shape clowns work best for toddlers and young preschool students. The main concept for the project is shapes and learning about them. Cut out triangles, circles and squares. Review the shapes with the students then lay the sample on the table. Give each student one of each shape. Allow the students to use the stamps and markers to make faces, hats and other decorations. Help students glue their creations together to imitate the sample clown, who has his hat on the top and his shirt on the bottom, with the face in the middle. Preparation: Cut triangles and circles from the paper. Fold strips of paper to make crinkled arms. Recycled clowns make great stand-up displays for a classroom or nice centerpieces for a clown-themed gathering. Use paper towel or toilet paper rolls, depending on the desired size of the clown. Give each child two to three triangles made from construction paper and allow them to stamp and decorate the paper. Wrap the paper around the tube and attach with tape. Make faces from construction paper circles and hats with triangles. A paper towel roll is big enough to use the center of a paper plate for the face. Attach the face and hat to the top. 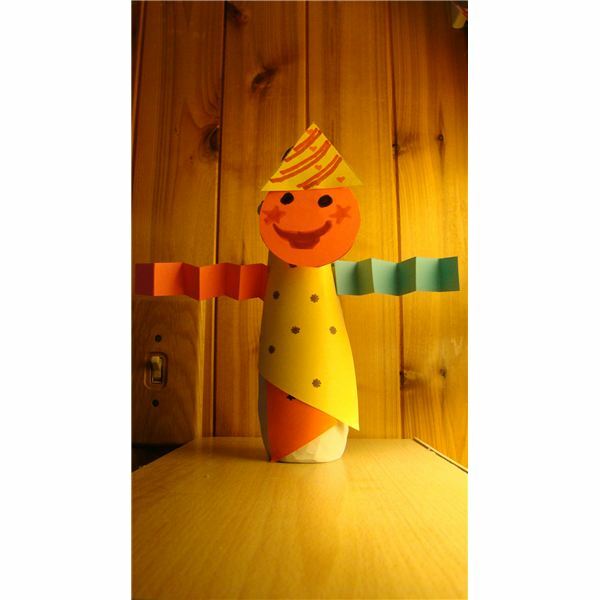 Allow the children to choose different colored arms then attach these to the sides of the clown with tape or glue. This project is fun for kids who love to dress up and play in the dramatic play area. Assign two shoe boxes to each child in the room. Ask each child to place his/her foot on the top of the box, then trace the perimeter of the heel. You will be making a hole similar to a shoe hole which is approximately the same size as the child’s ankle. Alternately, you can measure the diameter of the ankle, add an inch, and cut a hole from the box matching that measurement. Glue the tops to the boxes and then give each child both their boxes. Allow the children to decorate the boxes with the various decorative materials. Glitter, glue, markers, paper, stencils, stamps and many other materials make great clown shoes. Help the children put the shoes on their feet; the feet will slip through the holes and the children will be able to walk around in their shoes. Use masking tape around sharp edges or for children suffering from sensory deprivation. Preparation: The preparation for this activity may involve children; the decision to involve children in creating this product is dependent upon the age of the children. Cold cream is NOT non-toxic so children need to be old enough to not eat the products. Use a simple recipe, found at the Child Care Lounge, to make face paint for the children. Mix together 1 teaspoon cornstarch, 1/2 teaspoon water, 1/2 teaspoon cold cream and two drops food coloring. The result is a simple face paint that can be applied to the face to create clowns. Don't forget to supply a mirror and buy hypoallergenic cold cream from any drug store. 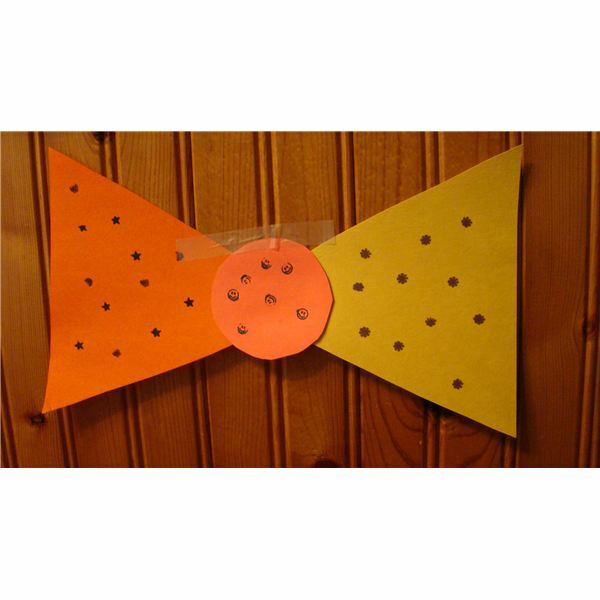 Create clown bow ties to decorate the room with simple paper and markers. Distribute the paper shapes to each child and allow the children to decorate the paper with stamps and markers. When the children are finished, attach the triangles by the smallest tip to the back of the circle. The result is a clown’s bow tie suitable for a wall decoration. An alternative to this project is to attach pipe cleaners or string to the bow tie by poking holes in the center of the circle and stringing the holes. Tie the string or connect the pipe cleaners behind the child’s neck, ensuring the bow tie is loose enough to avoid choking. Get parents involved with these activities, as parental involvement is a big part of early childhood. Ask parents to a clown party, where the children dress up and present parents with gifts, such as the recycled clown craft. If the circus is in town, ask parents to present pictures of the clowns if they attend. Invite parents to share their stories of clowns with the class, read a clown story or even to dress up like a clown. Ask parents if anyone is able to paint faces for the class or contribute in any other manner relating to the clown theme. Parents may also be interested in assisting with the creation of a few early childhood clown crafts.